Taking elegance and strength to the next level. Fusion Infinity perfects the latest trend in upscale dining, taking the best qualities of the Fusion line of glassware and enhancing them with sleeker shapes, wider bowls, and taller stems. Brilliant European crystal has been fused with super-strong magnesium to form a break-resistant, lightweight, graceful wine glass. Set Includes: 4 Fusion Infinity Cabernet, 4 Fusion Infinity Pinot Noir, 4 Fusion Infinity Chardonnay and 4 Fusion Infinity Champagne. Toast with confidence! Sleeker shapes, wider bowls, taller stems—the latest trend in wine stemware—take Fusion elegance and strength to the next level. Brilliant European crystal is fused with super-strong magnesium to form the world's most break-resistant glasses, as lightweight and graceful as they are durable. Science meets sophistication, and the result is shatterproof. Shaped to enhance the best qualities of your wine. Machine made lead-free crystal; never clouds or dulls. Dishwasher safe. 4 Fusion Infinity Cabernet/Merlot/Bordeaux/Shiraz: 10-1/2"H, 22 oz. 4 Fusion Infinity Pinot Noir: 9-1/2"H, 24-1/2 oz. 4 Fusion Infinity Chardonnay/Chablis: 9-3/4"H, 15 oz. 4 Fusion Infinity Champagne: 10-1/4"H, 6-1/2 oz. In the unlikely event your Wine Enthusiast Fusion Glass breaks, we'll replace it FREE, even up to 10 years after purchase! Click here for details. Overall Height: Cabernet/Merlot/Bordeaux/Shiraz - 10-1/2"; Pinot Noir - 9-1/2"; Chardonnay/Chablis - 9-3/4"; Champagne - 10-1/4"
Capacity: Cabernet/Merlot/Bordeaux/Shiraz - 22 oz. ; Pinot Noir - 24-1/2 oz. ; Chardonnay/Chablis - 15 oz. ; Champagne - 6-1/2 oz. How thin lipped are the glasses? BEST ANSWER: As you would expect, thicker than Riedel Vinum. Amongst the group, the Pinot glasses seem to have the thickest lips. Have put them through a lot over the past year--no problems. Recommended. I agree with the statement that they are thin and strong. The delicacy of the glasses belies their strength. The glass lip is fairly thin yet surprisingly hefty and they have a sturdy feel to them. They are thin and strong but not sharp edged. What is the stem height from base, to bottom of actual glass, on the fusion infinity wine glasses? BEST ANSWER: I should have asked this question before I bought a set. The answer is 5 inches. When I received the glasses I ordered I found that they would not fit in most of my kitchen cupboards. Fortunately, I do have one cupboard with adequate head room. I'm not exactly sure of the height (Maybe 4 inches) but I am a wine glass snob and they are perfect! Not too tall that they will break, but tall enough that it adds sophistication to the glass. I hope this help. Stems are 5" tall. White glass is 10" overall. Cab glass is 10 ½" overall. Pinot glass is 9 ¾" overall. The stem on the Cabernet are 5" on the Pinot 5 1/4"
I've had trouble with the fusion glasses breaking easily, is this normal I absolutely love the look and feel of them.? BEST ANSWER: The Complete Fusion Infinity Wine Glass Collection (set of 16) are not manufactured differently from the way they have always been made. I am sure you are only washing them in the top rack of your dishwasher or hand washing them, they are not break proof and we stand by our 10 year warranty. I am not too sure why you are having issues with them and our apologies to you. I have had the Fusion glasses for over a year and have replace half a dozen because of easy breakage. This morning I knocked on over on the counter and it shatter. They are not break resistant! We've had the glasses for nearly two years and none have broken. My wife uses one everyday, though we only use them as a group a couple of times a year. We like the look of them, too! I love the glasses too but I am having the same issue. However, customer service is great by honoring the warranty each time I call them. How high are the stems on the fusion infinity wine glasses? BEST ANSWER: The stems themselves are about 5"
Can you order less than the 16 glasses? 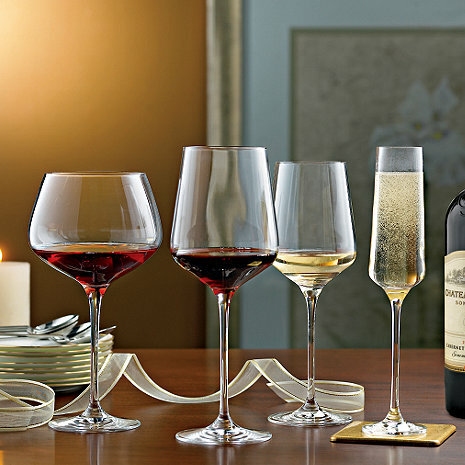 BEST ANSWER: The Complete Fusion Infinity Wine Glass Collection (Set of 16) glasses are sold in sets of four. You could get another smaller set but at this price it's a great value to a nice assorted set. What are they made out of to make them break resistant? BEST ANSWER: The Complete Fusion Infinity Wine Glass Collection (Set of 16) is made with European crystal which is fused with super-strong magnesium to form the world's most break-resistant glasses. They have magnesium in them. I don’t need champagne glasses. Any chance I could get 5 of the other 3 types instead? Can these glasses be etched? How tall are the stems? BEST ANSWER: They sell these in sets of 4 with personalization not as a set of 12.
what is the base diameter (trying to determine if they will fit in chair cupholder)? We were looking for some high quality glasses with a unique style. These fit the bill with their oversized style, good heft, and unique shapes. I think the only issues that one might find is that the bowls are quite big, so they can be hard to store. Also, they have a "wine enthusiast" logo on the base that I wish wasn't there. delivery very prompt, arrived in good condition. customer service excellent: 2 glasses had very minor manufacturing defects - W.E. immediately sent replacements. These are gorgeous well crafted glasses. They're light and make a beautiful ringing sound when tapped (which is a good sign of quality glassware). I've only tried out the flutes so far, but can't wait to break in the rest! A bit big by really high quality. My only complaint is to please remove the wine enthusiast logo etched onto the base of the glass. For how much this stemware costs, I don't want people to think they are drinking out of something ordinary. Beautiful set of Glasses. Very well designed and I actually noticed a stronger nose on the wines after switching to these new glasses. We purchased these wine glasses to use on a daily basis because they are engineered to be durable, however they are elegant enough to use with fine china. Their well designed shapes and proportions enhance your wine tasting experience. I bought myself this set for Christmas and use them nearly daily. I love them soo much, I bought my mother a set for Mother's Day. We just used them at my sisters baby shower and everyone remarked on their sleek design and crystal clear glass. These are great glasses. We needed them for the patio after another brand of glasses melted in my dishwasher (and we're supposed to be top shelf safe). These are strong and don't melt. I will ask for a second set for Christmas. They are also attractive. Love love love! Everyone notices the difference in their wine drinking experience. Great product!!!! Very nice design!!!! Great set of wine glasses! Good practical set of glassses for all occasions. Pretty & comfortable. Adds to wine drinking experience!! Just what my husband was looking for, great value for the great glasses that you get and a ten year warranty, what's better than that? These [...] were so immediately useful and enjoyed with a variety of wines. I highly recommend these. With granite counter-tops, we often have the opportunity to ding a glass....so far, very nice!!!! Classy style, fun to use, and practical! Arrived on time and in great condition. very good and user friendly online service. Delivery was on time and fast. Delivered fast, and everything was very well packaged, so even if somebody dropped the box nothing would break. I was having a large group for a house partie and did not want to use good glasses that would break. I hate drinking out of plastic so I purchased 6 boxes and love these glasses I did not have to worry about glasses breaking. A little taller than I thought, so I just hand wash. We got them for everyday use, but everyone admires them so we have also used them for entertaining. The glasses are beautiful and I love the longer stems. These glasses are beautiful. I love the shape. It's traditional with a stylish twist to it. Highly recommend them! These are so durable as well as beautiful and elegant...I dropped one of these glasses on the tile floor in the kitchen and it didn't even chip...I love these glasses. I love this wine collection! I get so many compliments on them. People believe I spent triple of what they really cost. I was afraid they would be too thick because of how break resistent they were advertised, but there perfect. The bowl of the glasses really brings out the aroma and flavors of the wine. Great set! Diffently a must have!!! I was skeptical at first based on never seeing or touching the glasses. Much to my surprise they are a very nice set of wine glasses that you can use for any occasion from informal to formal. I would recommend this set to anyone interested in a fine set of glasses at an affordable price. Very happy, these glasses look terrific! Excellent set, looks great, seems durable, haven't tried them in the dishwasher yet. I am an 89 year old downsizing woman. Gave all the nice glassware etc. to my girls and was left with a hodge-podge of wine glasses. So 4 of each Infusion infinity was just right! Pleased that they are strong and will suit my need to a "T"! I have enjoyed using Fusion wine glasses at wine bars dining-out. It was great to be able to stock a new home bar with these light-weight but strong glasses. Very much as advertised, it's glass and it's strong. I love the size and style of each glass in the set. Excellent Stemware - We're Pleasantly Surprised. We've had this set of 16 for a few months now, and they have quickly become our favorites. We assumed that because of the breakage guarantee, the glasses would be heavy, clunky things. Quite the contrary. They are exceptionally light - lighter than our comparable Reidels. They are also extremely well balanced. Very pleasing to hold. Swirling capability is excellent as well, with no spills. The glass is excellent, and does not appear to be clouding or etching after a few months if dishwashing. The only thing left is to see if the replacement guarantee is a straight-forward as written. After going through many Reidels and Spielgaus, we'll hope Wine Enthusiast is true to their word! I love my fusion infinity wine glasses Their superior quality and perfect construction for burgundy/pinot noir, bordeaux/cabernet, white burgundy/chardonnay, and champagnes completes my wine tasting glassware needs. An incredible bargain. A must buy! My husband and I have had these for a couple of weeks now. We've used all but the champagne flutes. They feel special, yet they're not so frail that you constantly worry about breaking them. To me, they make the wine taste better! I am very pleased with these wine glasses. They are delicate, beautiful, and provide a great sound when toasting. I purchased these for use by the pool, but upon receiving them it is clear they will be used from the pool to the Dining room table! I love the glasses. Happy that all my various wine glasses match and elegant looking. Makes entertaining that much more fun. I have searched a lonnnngggggg time to find replacements for my Oneida Compose red and white wine glasses. This are almost identical so close you can't hardly tell. I love the weight, size and shape. That's why I was so sadden when I broke some of the Oneida's. Very pleased with the quality and speedy deliver. Ordered on Tuesday and I had them by Thursday. The only thing I didn't like was the logo on the base that is quite large and to me ruins the gorgeous glass. I got this set of glasses for my sister, and she absolutely loves them! They are beautiful glasses, and the price for them is amazing! Great wine glasses all the way around. Good feel. Easy to hand wash and dry. Some are a little tall for standard cabinet shelving (champagne flutes and Cabernet glasses). My husband received these glasses for his 75th birthday.He just loves them!!!! I've tried each one now and all are really bringing out the wines! My favorite is the pinot noir glass, may be a bit big to fit into some cabinets, but love it! Love the different shapes and have taken the advice in using which for what wines. It does appear that the glasses shapes do enhance the wines taste and enjoyment. Glasses are very delicate to the touch. Ironically, I knocked one off the counter last night and the stem broke, but not the "bowl" of the glass which with traditional glassware would have shattered completely. Definitely recommend the set as an everyday use. I bought these for my adult son for his birthday and he absolutely loves them! He is a big wine collector. Great value! My boyfriend and I are really happy with this set. They are beautiful and clear and hardy! I love the modern look of them too! The glasses are beautiful. The set has the perfect mix for enjoying a variety of wines. Iâ? ?ve bumped two glasses together rather hard (accidentally) and one on the granite and they didnâ? ?t break! Some reviewers mentioned the Wine Enthusiast logo on the bottom. That was helpful to know in advance. Theyâ? ?re pretty small and not large enough to detract from the glasses. I already had received 4 of these glasses as a gift and have appreciated their simple elegance and strength. I have a full set of fine crystal glasses yet rarely use them because they're so delicate. These I'm much more comfortable using regularly and have received numerous compliments.